Bishop Chuck Leigh & Rev. 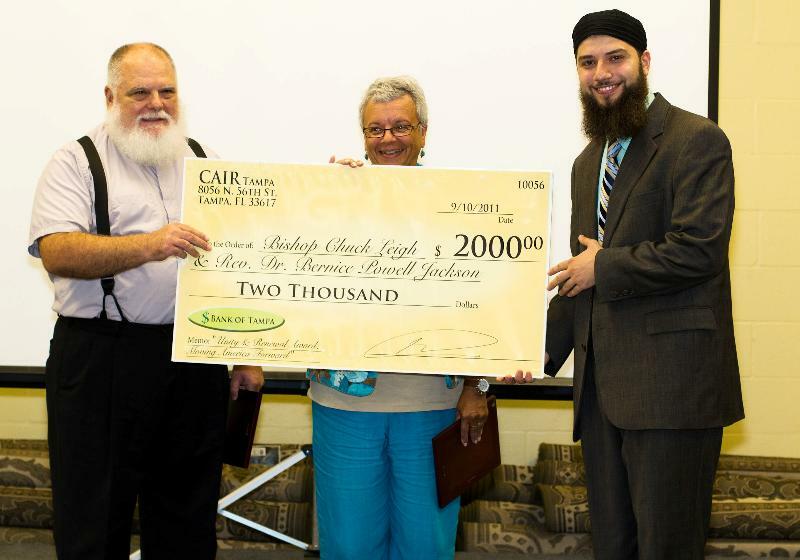 Dr. Bernice Jackson awarded $2,000 for "helping move America forward from the tragic events of 9/11"
This past weekend, CAIR-Tampa presented Bishop Chuck Leigh of the Apostolic Catholic Church and Rev. Dr. Bernice Powell Jackson of the United Church of Christ with the "Unity and Renewal Award" in recognition of their "exemplifying the spirit of moving America forward from the national tragedy of 9/11." CAIR-Tampa executive director Hassan Shibly stated: "Bishop Leigh has consistently used his position and authority as a nationally-recognized Christian leader to advocate for fair and just treatment of all people. He seeks to redefine our nation as a place of justice and compassion, especially in these most difficult times. His efforts embody the ideals of liberty and unity that make America such a great nation." "Dr. Jackson has been an activist on behalf of human and civil rights and women's rights and an advocate for peace with justice around the world for four decades. Her activism is an example of the ideals needed to unite our country against hatred, oppression, and injustice and keep America the safe and free nation we so cherish. " Shibly continued to explain how Bishop Leigh and Dr. Jackson's work both exemplify the true meaning of interfaith work: "True interfaith friendship is not where we pretend to agree with each other by misrepresenting our views and then building a false friendship based on that. Rather, true interfaith dialog is where we recognize that we may and can disagree on many issues of faith and politics, but recognize that such differences need not prohibit us from loving each other as neighbors and human beings and working towards the common good." Bishop Leigh accepted the award stating: "I am so very pleased to be accepting this award since for me it represents the consistent and positive effort of the Islamic community to reach out in friendship to people of good will in our nation. Among true believers of any faith there can certainly be disagreement, but never animosity or ill will. " Rev. Dr. Jackson said: "Words are really inadequate to express my thanks to CAIR and to the Islamic Community of Tampa for this award. It means so much to me...we should be giving an award to CAIR, both here in Tampa and across this nation, for the work you are doing, not just on behalf of the Muslim community but on behalf of us all. For every time you challenge stereotypes or discrimination on behalf of Muslims, you challenge them on behalf of us all. As an African American who has been involved in working for justice in this nation for many, many years, I know how important it is that our nation live up to the ideals we espouse. We can't just talk the talk, we must walk the walk. So thank you for helping us to be a better nation. "